To save her people, she must steal the face of a god. For two hundred years, Jala’s people have survived by raiding the mainland. By shaping the reefs around the Five-and-One Islands into magical ships, they can cross the ocean, take what they want, and disappear. Or so they have always believed. On the night after Jala becomes queen, a tide of magical fog sweeps over the islands, carrying ships form the mainland. Inside are a desperate people, driven half-mad by sorcery and looking for revenge. 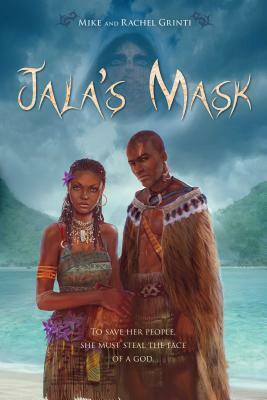 Now Jala—caught between her family’s unending ambitions, the politics of the islands thrown into turmoil, and her unexpected love for the king—must find a way to save them all if she can. But there are greater powers at work, and the politics of gods are more terrifying than she could have imagined. To save the Five-and-One Islands she may have to leave them behind. Mike and Rachel Grinti are a husband-and-wife writing team. They met at a writing workshop in 2002, though they didn't start writing together until a few years later. Rachel is a children's librarian. Mike fell in love with reading after he checked out The Hobbit from his school library and has been hooked on fantasy and science fiction ever since. When he's not writing or reading, he's probably playing video games and has a day job making them.